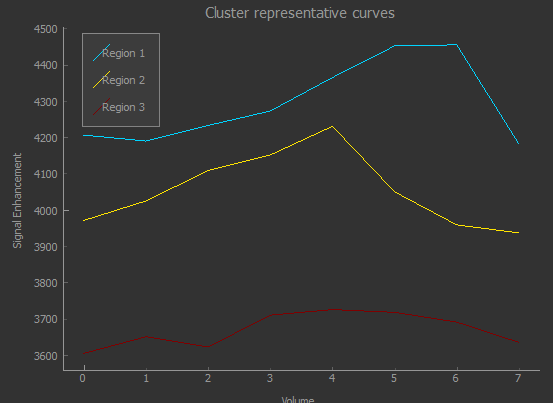 Clustering uses the K-Means algorithm to cluster 3D or 4D data into discrete regions. When used with 4D data, PCA reduction is used to convert the volume sequence into 3D data before K-Means is applied. For 4D data, the number of PCA modes to use for reduction to 3D. On clicking Run, a new ROI is produced with each cluster assigned to an integer ID. This option is available when clustering 4D data, and displays the mean time-series curves for each cluster. In this case the clusters correspond to two distinct phase offsets of the signal curve, with a third cluster picking up voxels with weak or no signal. This option shows the number of voxels in each cluster, overall and within the current slice. Having generated clusters, it may be desirable to merge some of the subregions - for example if two are very similar, or one contains very few voxels. The Merge tool allows you to do this by specifying the two regions to be merged. An Auto Merge tool is also provided to automatically identify subregions for merging.